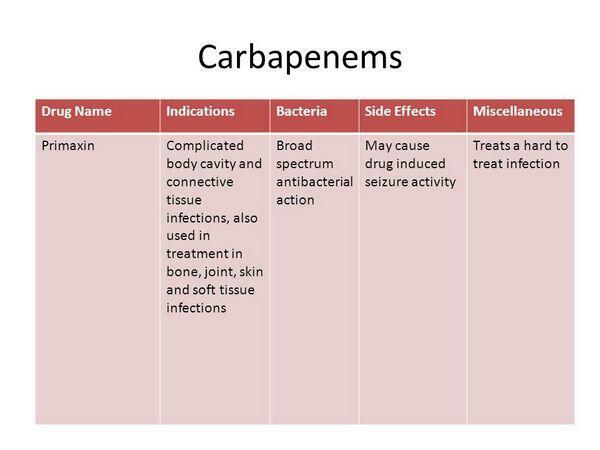 Carbapenems are penicillin derivatives that have good activity against gram-positive and gram-negative aerobic and anaerobic bacteria. They are highly resistant to β-lactamase and have a very favorable spectrum of activity. A drawback of these agents is that they are available in IV form only. These agents are used in the treatment of severe, complicated acute exacerbations of chronic bronchitis when sepsis is of concern. The incidence of adverse reaction is low (1%) and occurs predominantly among the elderly or patients with predisposing central nervous system conditions. Carbapenem antibiotics include imipenem (Merck's Primaxin) meropenem (AstraZeneca's Merrem), and ertapenem (Merck's Invanz). This section reviews only imipenem/cilastatin, as this class is generally used in just a small subset of acute exacerbations of chronic bronchitis patients. 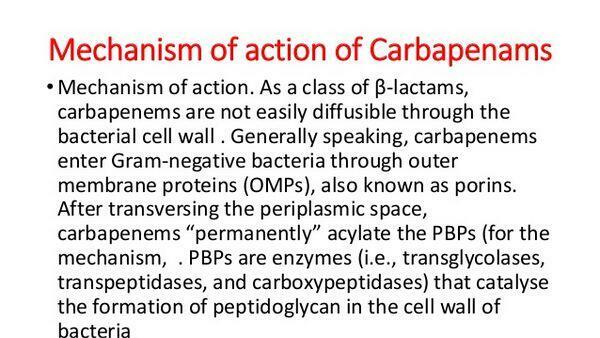 Like the penicillins, carbapenems bind to penicillin binding proteins in bacteria and prevent bacterial cell-wall formation. 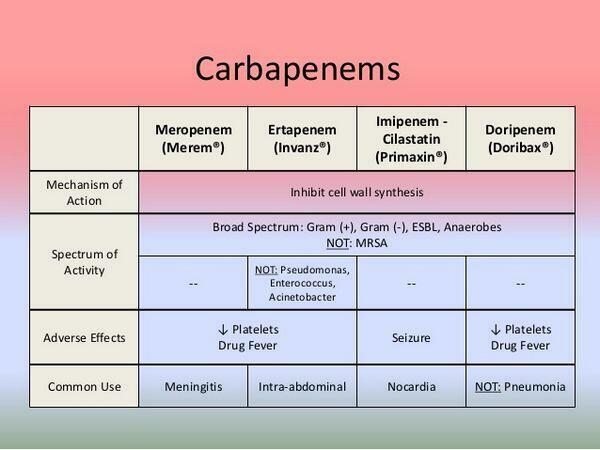 By interrupting cell-wall formation, carbapenems induce cell lysis and death. Imipenem/cilastatin (Merck's Primaxin) is a prototypical carbapenem. Imipenem is coadministered with cilastatin (a peptidase inhibitor) to prevent its metabolism into nephrotoxic metabolic end products by peptidase enzymes in the body. Coadministration allows extended imipenem dosage intervals and causes less toxicity. Irnipenern/cilastatin is usually reserved for severe acute exacerbations of chronic bronchitis in the intensive care setting for patients developing sepsis. In this setting, the agent is often administered with an aminoglycoside. This agent will retain its patent protection through 2009 in the United States, but lost its patent protection in Europe and Japan in 2005. An open-label trial compared imipenem/cilastatin with meropenem (both IV) in 173 hospitalized patients with severe acute exacerbations of chronic obstructive pulmonary disease. The clinical response at the end of treatment was favorable in both groups, with a cure or improvement achieved in 97.6% of the meropenem patients and in 96.3% of the imipenem/cilastatin patients. Nausea or vomiting was reported more frequently in patients treated with imipenem/cilastatin, whereas an increase in aminotrans-ferases (indicative of liver damage) was reported in the meropenem group.